Librarians and teachers in a search of solid nonfiction science books should take notice of Sneed Collard's latest middle grade work, Hopping Ahead of Climate Change. In this 64-page narrative, Collard focuses on the work of biology professor Scott Mills as he studies snowshoe hares in the Rocky Mountains. A mystery has unfolded. As climate change has shortened the winter in the Rockies, a number of snowshoe hares are now "mismatched" or have white fur when the ground is bare and brown. This can be deadly to a hare trying to avoid predators in wild. Readers will be interested in the photos and description of the study conducted by Mills and his team as they pinpoint how long the hares are mismatched as well as the reasons why. The book effectively uses graphs, diagrams, photos and maps to convey information to middle grade readers. Collard does an excellent job of providing background information about causes of climate change or global warming. Back matter includes a glossary, list of websites and related books. 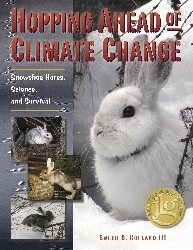 Read Hopping Ahead of Climate Change in science classes studying animal adaptations or the effects of global warming. Pair with The Polar Bear Scientists by Peter Lourie. I have been trying to get my hands on this book, Cathy! I had our library order a copy, but it hasn't arrived yet. I loved his Firebirds--another great book. Perhaps I even read about that one here :).